The paper plate is the base for the craft. Cut out the center of the plate (have students write their name on the back of the paper plate at this point). Then have students trace their hands on green paper and cut the hand prints out. Glue these on the paper plate, curling the fingers in a bit by rolling them. After you’ve layered the green hands to your preference, use the red construction paper to make berries and a bow (click here for the bows & berries template). There you have it! This craft can be fun at family parties and other gatherings where you have guests of varying ages. Having different sized-hands on the wreath adds some variety. This can also be a fun craft for grandparents to do with their grandkids, etc. Merry Christmas! 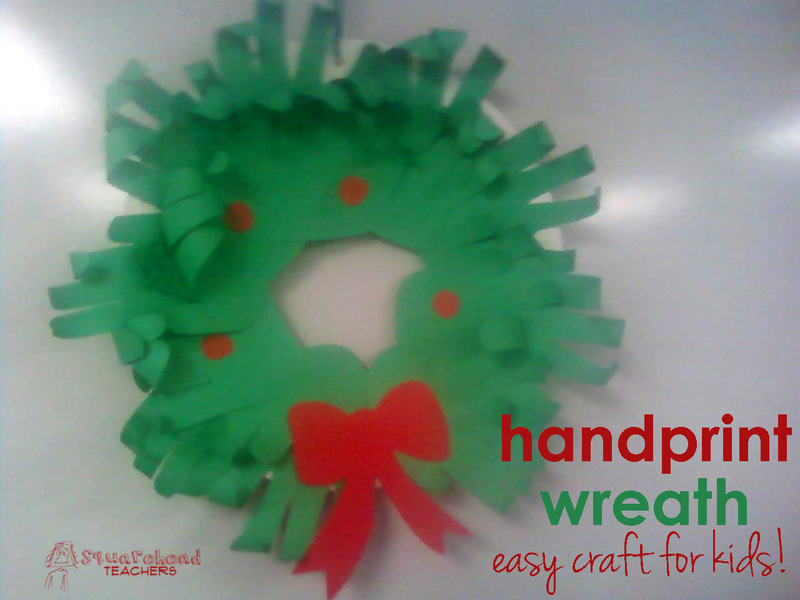 This entry was posted in Art/Crafts, Christmas/Winter, Holidays/Seasons and tagged Art/Crafts, Children, Christmas, crafts, Education, Elementary School, holidays, Homeschool, Kids, Teacher Resources, Teachers, Teaching, wreath by Squarehead Teachers. Bookmark the permalink.